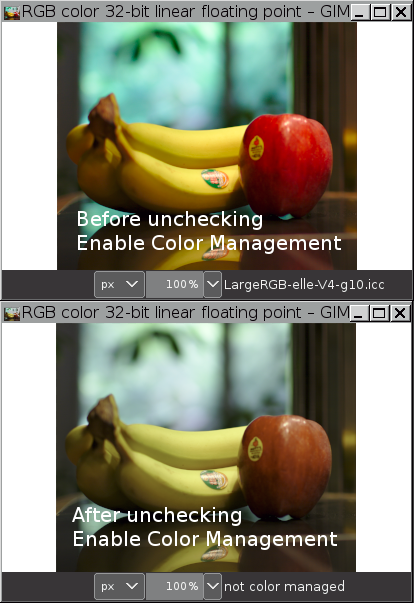 If unchecked, Enable Color Management assigns a GIMP built-in sRGB color space to your image. Also, if you've selected to display the image's assigned ICC color profile on the title or status bar, unchecking Enable Color Management prints the phrase "not color managed" to the title or status bar in place of the previously assigned color profile. Enable Color Management is checked by default. It's best to leave this option checked. You can access this command from the image menu bar through Image → Color Management → Enable Color Management. The best possible advice is to never uncheck Enable Color Management. 6.9.3. What does GIMP do when Enable Color Management is unchecked? If the image is at Perceptual gamma (sRGB) precision, the ICC profile "GIMP built-in sRGB" is assigned. If the image is at Linear light precision, the ICC profile "GIMP built-in Linear sRGB" is assigned. You can confirm that one of GIMP's built-in sRGB color spaces has been assigned by checking "Image/Image Properties/Color Profile". If you have set up the title or status bar to show the image's color space, then the title or status bar will display a message that the image is "not color managed". In reality the image is still color managed, but now the image is color managed "as if" it were in one of GIMP's built-in sRGB color spaces instead of whatever color space it's actually in. 6.9.4. When Enable Color Management is unchecked, what happens to the image and the image appearance? Assigning a new profile to an image doesn't change the image's actual channel values. Assigning a new ICC profile only changes the meaning of the channel values, which means the image appearance will change (unless the original and new profile are functionally equivalent). If the image was already in one of GIMP's built-in color spaces (or if the assigned ICC profile is a profile that is functionally equivalent to the assigned GIMP built-in sRGB profile) then the image's appearance will not change. What GIMP Precision channel encoding — Linear light or Perceptual gamma (sRGB) — the image was in before the Enable Color Management box was unchecked. How far the image's originally assigned ICC profile's channel encoding ("TRC") is from the GIMP Precision channel encoding. How far the image's originally assigned ICC profile's Red, Green, and Blue chromaticities are from GIMP's built-in sRGB chromaticities. In both screenshots shown below, the image is color managed: An ICC profile is assigned to the image, and that profile is being used to send the image colors to the screen. 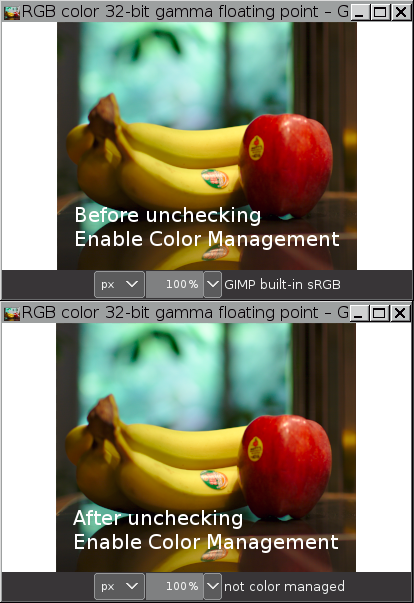 But in the second screenshot, after unchecking Enable Color Management, one of GIMP's built-in sRGB profiles has been incorrectly assigned to the image, so the colors look wrong. If your image's originally assigned ICC profile doesn't have the same channel encoding and chromaticities as the GIMP built-in sRGB profile, and you uncheck and then immediately change your mind and recheck Enable Color Management, the originally assigned ICC profile will be reassigned to your image and your image channel values will be unchanged. Otherwise, whether or not you can recover the originally assigned ICC profile and correct colors for your image depends on what else you've done between the unchecking and rechecking of Enable Color Management. Again, the best possible advice is to never uncheck Enable Color Management.